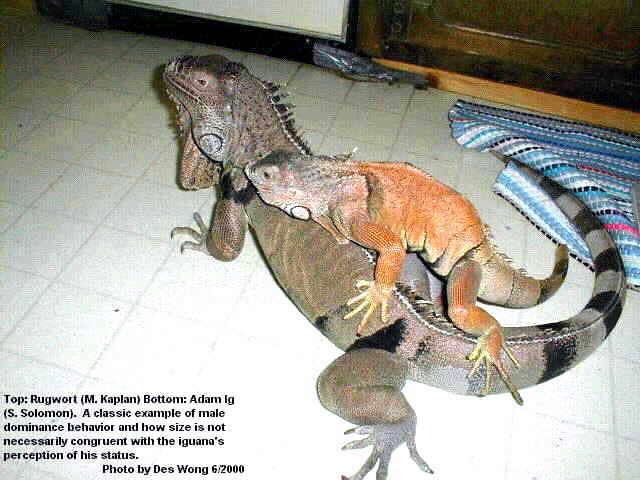 Most people think that the bigger the iguana, the higher the status. They think that, if two iguanas are put together or otherwise allowed access to one another, that the larger iguana will always be the one to attack or intimidate the smaller one. Rugwort may be familiar to some Anapsid.org readers. Rescued at age 22 months with a 7" SVL, he grew to a whopping 13" SVL, his spine and head permanently deformed as a result of severe and prolonged metabolic bone disease. He had evidence of at least two previous tail drops and regrowths when he arrived. A couple of years later, he was bitten on the new tail growth which resulted in dry gangrene setting in, and so that part of the tail was amputated. Rugwort was the omega iguana in my group of iguanas. As the years passed and I stopped doing iguana rescue, he eventually became my only green iguana. Soon after I got Mikey, a then 6.5" SVL Cyclura iguana, Rugwort slipped into beta status, with the occasional omega day. On the day this photo was taken, Sue Solomon, and her iguana Adam Ig, came to visit. I had previously met Adam Ig in person at his and Sue's home, a place where Adam Ig reigned as the colorful alpha male. At my house, however, he was not just outside of his own territory, he was in someone else's territory: Rugwort's. Despite the size difference, Rugwort wasted no time making certain that Adam Ig understood just what his position was in Rugwort's territory. Note Adam Ig's dull stress colors, while Rugwort is a vibrant dominant male orange, a color rarely seen on him when he was one of a group of iguanas all living here.